Guardian angel tattoos are a very popular choice for tattoos. Angels can possess several meanings depending on which religion they are associated with. Generally, angels represent good spirits that are around to counteract evil spirits. They can represent peace and joy. Angels are messengers or more specifically messengers from God. Angel tattoos are also very popular because of the guardian angel theme, a figure to watch over the individual during day-to-day life. An individual often gets an angel tattoo in order to remember someone that has died. Tattoo designs can be of full angels in various tattoo design patterns or just various decorative wing designs. Some examples of angel tattoos are shown below. 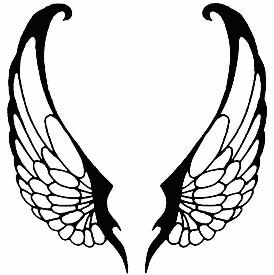 Have you designed an angel tattoo or angel themed tattoo. Did you get an angel tattoo that you love, whether you designed it yourself or not. If so, healthy-skincare.com would like you to share your tattoo experience or your tattoo design by visiting this page. An individual may get an angel tattoo for no specific reason other than the look. There are many design choices and many ways to be creative with angels or angel wings in tattoo designs. However, some individuals get angel tattoos because of what they represent. To summarize once again, angel tattoos can represent a protective aspect - guardian angel. Guardian angels watch over humans to ensure their safety and also to protect their souls. Angels are thought of as spiritual beings, more powerful than ordinary humans. Individuals that value religion as an important part of their life and identity may want to get an angel tattoo. 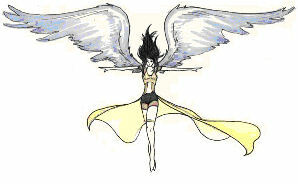 Angels are also referred to as messengers from God. Finally, angel tattoos are often used to pay tribute to a lost love one. Tattoo skin care is important, whether you are getting guardian angel tattoos for the first time or are adding to your existing tattoo collection. The tattoo eBook available from healthy-skincare.com offers valuable tattoo information. The history of guardian angel tattoos and other designs. What you should know before getting a tattoo. The all important subject of TATTOO SAFETY. Pain associated with tattoos and how to minimize the pain. Skin care for a new tattoo. In addition to the above subjects, you will also find chapters dealing with tattoo designs such as Celtic tattoos, flower tattoos, tribal designs, popular designs, tongue tattoos, etc., and the meaning of some of these tattoo designs. Finally, there are several chapters dedicated to application techniques for tattoos, cost of tattoos, choosing a tattoo parlor and tattoo artist that is right for you, tattoo pros and cons, and in case you need to remove a tattoo – a couple of chapters on tattoo removal and tattoo removal options. Do not hesitate. If you are thinking of getting your first tattoo, then the tattoo information provided in this eBook is a must read. If you are more experienced, this book is still a valuable resource and refresher. This tattoo eBook is available from healthy-skincare.com for only $4.99 (US funds).